Do you find yourself sleepy and sluggish after lunch at work? Do you reach for coffee more than two times during the work hours to stay awake and alert? That could be caused from the type of food you eat for breakfast or for lunch, food has a direct impact on our energy levels and even very healthy choices of foods could leave us sleepy and tired because they require more energy to be broken down and digested. If you feel like that then instead of gobbling down three or four cups of coffee in the day, try to have these foods for breakfast and lunch for more sustainable energy levels. 1- Peanut Butter and Apple. 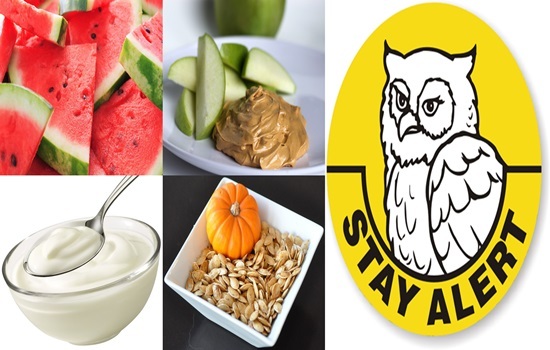 The peanut butter will provide you with sugar, protein and fats for your brain to function on high rates while the apple will help to get it digested quickly and will provide your body with quick glucose for a quick boost in energy. Moreover, fruits in general get digested quickly on an empty stomach and they provide an energy boost. Watermelon is refreshing and nutritious, it is also the easiest and most delicious ways to combat dehydration that could be caused from having too many caffeinated beverages and not drinking enough plain water, dehydration is a main cause for low energy levels and headaches even the slightest levels of dehydration. Watermelon is very filling and contain simple carbohydrates that will give you a quick boost in energy. This is a handy snack that should always be in your bag for your 11 am hunger, it is rich in magnesium which is a mineral that was reported to be very important for people involved in high physical activities, the more you exert physical effort the more your body uses oxygen which tires you quickly, eating a snack rich in magnesium will replenish the oxygen and boost your energy. Yogurt with some fruits and maybe honey is a great snack to boost your energy and concentration, it improves metabolism and can fight against Chronic Fatigue Syndrome. It will also provide you with some protein, essential vitamins and hydration for your body. Water is an essential way to keep your energy levels high and metabolism at its peak, the water is needed to break down fat and convert it into energy, so make sure your body is well hydrated by drinking at least eight Glasses of water. Besides laziness and tiredness, other symptoms of dehydration include dry skin, headaches and dry saliva.